In today’s ever increasing technical world, with downsizing, job automation and outsourcing you need a union which will represent you and your fellow workers with skills developed through years of training and practice. A union where you are represented at all levels by a group of trained professionals who understand your concerns and the work you do everyday to survive in an ever increasingly difficult world. A union which will give you pride. A union where the phrase “Don’t Beg – Bargain” is more than just words. If you are interested in finding out more you can call us at 905-671-9119 or drop us an email with a confidential contact number and a time for us to speak with you. – Mississauga Lodge – Local 2413. 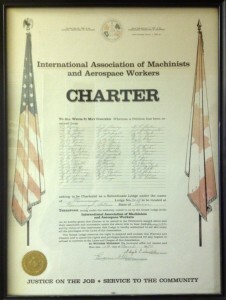 The original 55 members developed the fledgling Local Lodge into a force which now represents aviation workers, transportation workers and workers in the manufacturing sector, building a cohesive force which has gained a reputation as a fighting force for decent working conditions and equitable pay for its members. In 2016 we embarked upon our 46th year with a renewed pledge to work toward improving working conditions, pay and job security of our members.